We provide quantitative image analysis support for the research inquiries of both departmental and external collaborators. These efforts comprise a portion of our ongoing development of computational techniques for facilitating quantification of anatomical and/or functional variability in different populations or over time as a consequence of disease or injury. Areas of active research include studies of neurological disorders (e.g., traumatic brain injury, brain tumors, Alzheimer’s disease), collaborative functional pulmonary research using hyperpolarized gases, and the open-source dissemination of data analysis tools. Venues for the latter include the Insight Toolkit (ITK), Advanced Normalization Tools (ANTs), and ANTsR—the ANTs interface with the R statistical project. Current software development efforts also include porting deep learning architectures to the R language via ANTsRNet. General algorithmic development and translational work. 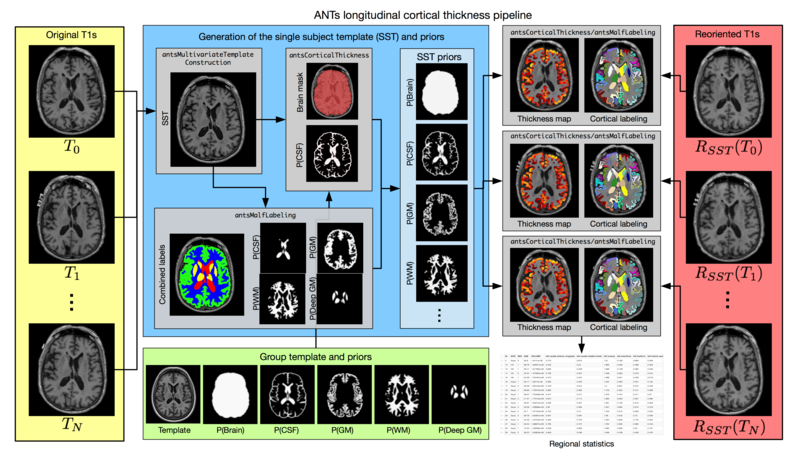 Diagrammatic workflow of the longitudinal cortical thickness analysis pipeline available in ANTs. Please see here for more details.